Celebration, to me, is about being with families, friends and loved ones. It is about being home (or even just wanting to be home.) I have faith in love towards the people who have been there for me – for better for worse. So, naturally…I just want to be with these people on a big day like today. For my daughter, however, today is a big day about looking good. Yesterday was about shopping for outfit to make us look good. 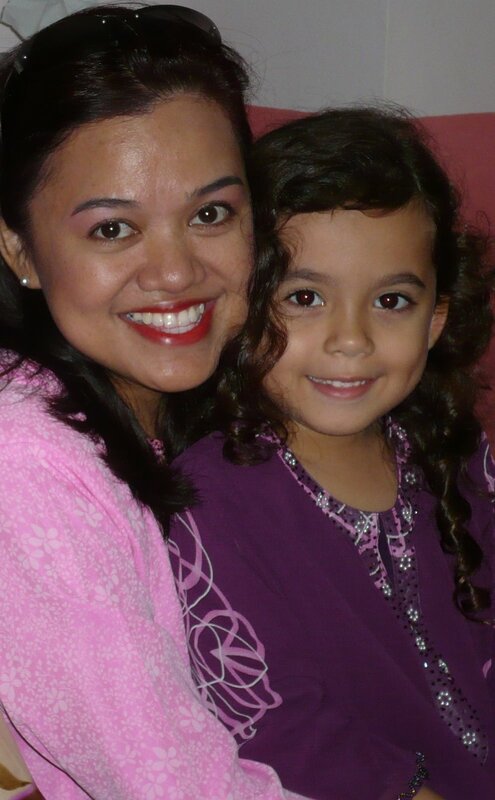 By the way, my baju kurung is from last year’s Raya. Kitreena just had to have purple this year. 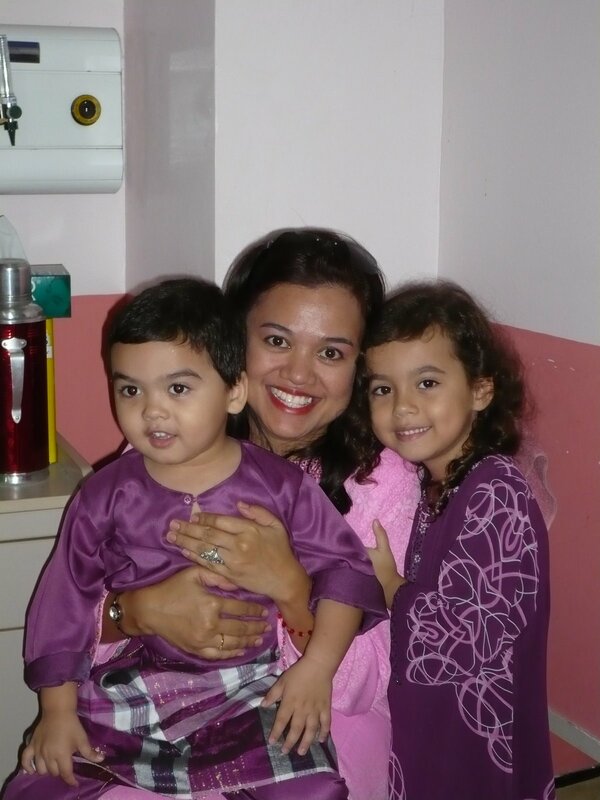 Hence, the ‘Monchies In Purple’ theme for 2008. I got Bibik a pink baju kurung to match mine. Yay for Bibik! We were at the hospital with my Mom the whole morning – if you wonder about the white and pink wall and a hot-water thermos beside us. It was a great feeling to see Mom not wearing the hospital robe for the first time in two and a half months. She has lost kilos upon kilos of her weight, and a few ounces of her memories. But we know, she is as heaved with love for us as always. We were all at the hospital and as remote as can be from being home. And yet we felt so at home just to be with Mom and the whole family. But it sure feels different this year, besides Raya-ing at a hospital. My small family is getting smaller and that is not a small difference. (Neither it is a small matter.) Hitherto, what Kitreena said yesterday – the shopping day – got me thinking. A lot. We were driving out of the Waretek basement parking when she said, “It’s a fun day today, Mom. I really like it when we go shopping together.” I must admit, it is fun doing the girls’ stuff now with my soon-to-be-sixteen daughter. I never used to want to take her shopping, especially when we needed to get HER stuff! It could take a few days, a few malls in a few cities just to get a pair of shoes. “I had fun Mom. And I hope Daddy’s having fun with his new girlfriend, too,” said Kitreena. I thought I was going to choke on my reply, but I didn’t. “I am sure he is, monch.” I meant what I said. And I thought, yeah…Daddy had better have fun while fun lasts. It sure did not last with me. But of course I didn’t say that to Kitreena. I was not going to be bitter on the eve of a big day. Nah. Never have been and never will be. There’s more to life than only bitterness and lies. So I said my truth to my daughter and drove home. The drive sure drove me home. Hey you! Where have you been? I have been googling you for years, ya know! Let’s get together one of these days and have a giggle or two like we used to. Do you remember the poem ‘Talian Kasih’ written in 1994? we used to know each other…during the years of ukm’ed and upm’ed …been so grateful of knowing n reading ’bout ur family…sorry 4 ur mom though…hope she’ll get better soon..
Em koi sai loh Dee. Memang memanchor-manchor benornye. And Kitreena’s the best! Hehe. She’s my bakul I can pretty much lift once in a while. I believe I can spell many more words to describe these people’s undescribable morality – or rather the in-existence of it. It’s just not worth my time spelling je. Ahak ahak. Thank you again for your special visit the other day! Kitreena has been asking about Iman everyday since. As for Edrick…you’ve seen him. He’s a guy without questions, for he is THE answer. Hoyeh for Edrick! Thank you for reading from such a distance. Thank you for the wishes. Salam Aidilfitri to you too. p.s. I actually prefer anonymity with a name – even if it’s just a pseudo one. 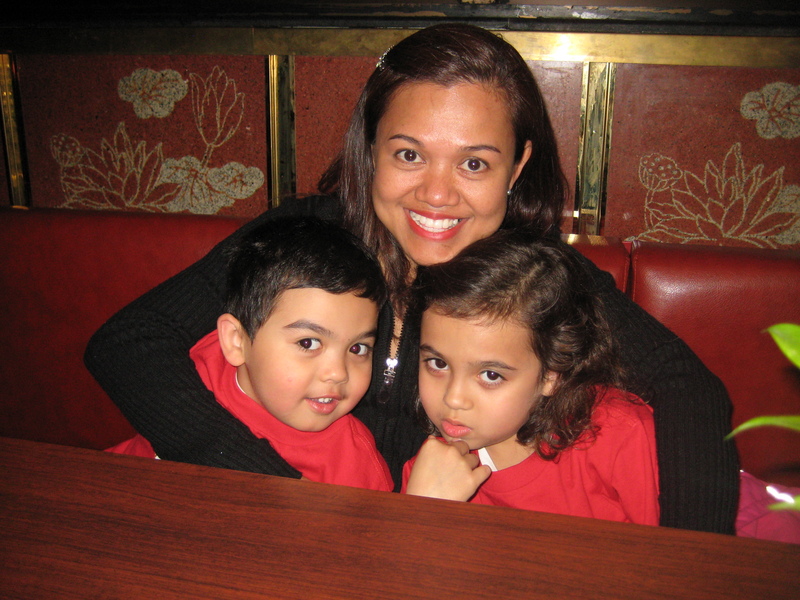 Have been reading your blog for a couple of weeks now, and its sooooo good to see you and the kids happy. Selamat Hari Raya. Selamat Hari Raya Enida, Kitreena and Edrick! I would like you to know again that HE doesn’t deserve you guys. He is stuck with someone as soul less as He is. Trust me on this one. For someone to leave a beautiful family like yours, He must have been drained of every single ounce of common sense, sanity and soul. He and his not so gorgeous and out of shape partner are just Fun spelt with E.V.I.L! You’re good Enida, you’re good. I have no worries. great to see u and the children smiling, not only with ur lips … more so in ur eyes! love is …reaching out for another, and wishing for them even better things than for urself.